After showing off their first original fighting game in decades last April Fool’s Day, respected Japanese game studio Arika arrived at Evo 2017 this past weekend ready to demo the project for the genre’s most passionate fans. Hopes were high for the fighter currently known as “Mysterious Fighting Game (Title Undecided),” and while it may not have an official name, Arika carries a lot of respect in the fighting game community. The studio was founded by Akira Nishitani, who cut his teeth at Capcom developing Street Fighter II, Final Fight, and X-Men: Children of the Atom. His team has been responsible for the beloved Street Fighter EX series, which brought the franchise’s 2D gameplay into the world of 3D for the first time. Funny enough, the untitled game, which is being referred to as Fighting EX Layer by the fighting game community as a nod to Arika’s history with Street Fighter EX and their original Fighting Layer from 1998, was always meant to be a joke. By combining pieces of an old 3DS project called Fighting Sample and numerous ideas Nishitani collected over the years, they were able to put together a competent-looking fighting game that immediately piqued the community’s interest. In an interview, Nishitani told Compete the fighting game community’s overwhelmingly positive response to the joke made his team believe it could be turned into a legitimate release. They quickly set about expanding the mechanics, most noticeably with the new Gougi deck-building system. Arika’s new game allows competitors to build customized decks of unique Gougi symbols that do things like build additional super meter, increase a character’s speed, and turn heavy attacks into guard breaks should certain conditions be met. Players at Evo compared this mechanic to Street Fighter x Tekken’s gem system, but Nishitani said he didn’t pay much attention to the 2012 crossover. Those gems provided small benefits to players of that game, but Gougi will be much more important in Arika’s project. Nishitani also expects players to personalize their Gougi strategies. While pre-built decks were available for players at Evo 2017, Arika plans to allow complete customization should the project secure an official release. Rumors circulated shortly after the April Fool’s reveal that Arika was looking into crowdfunding in lieu of a traditional publisher, and this was confirmed during our discussion. Nishanti said the studio had looked into crowdfunding but is no longer pursuing it, noting that “other things” have happened. He declined to elaborate, but perhaps that means they’ve secured a publisher. 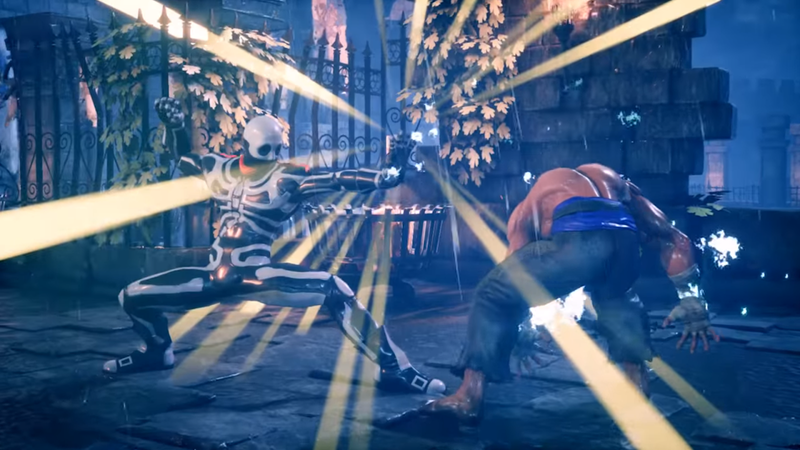 Arika broadcast a new trailer for the game during the Evo 2017 finals on July 16, revealing that Street Fighter EX favorites Skullomania and Darun Mister will be joining fellow Arika originals Kairi, Shirase, and Garuda in the playable cast. Even as a joke, Arika’s mysterious new fighting game lit a spark in the competitive community. The studio’s small Evo booth, with its single setup, saw a consistent flow of traffic, and everyone we talked to was amazed at how well the project plays in these early stages. The entire genre is driven by a sort of remixed nostalgia, and the reaction to Arika’s return signifies this probably won’t change anytime soon. Let’s just hope that “Playable on April Fool’s 2018?” line from the trailer is more prediction and less wishful thinking. Special thanks to Andrew “Jiyuna” Fidelis for his assistance translating our conversation with Nishitani-san.